French naval giant DCNS offers variety of naval systems in the defense exhibition held in Goa. 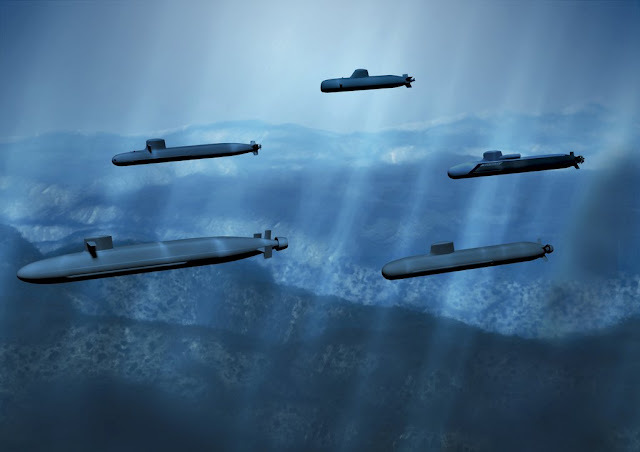 The systems include next generation Barracuda submarine, Mistral helicopter carrier and evolved aircraft carrier model, the showcased models are all already front running in many naval tenders, which include the Scorpene submarine. As expected earlier, The french formally offering the Barracuda submarine for the Indian navy's P 75I program. DCNS is front running in the Australian collins class replacement program, who also offering the same variant to Indian P 75I. which capable to launch cruise missile from vertical tubes and also capable to deliver marine commandos and capable to operate unmanned underwater vehicle's. Barracuda is the French nuclear submarine, who is in construction as of now, French Navy plans to receive the first Barracuda by next year. They also modded the submarine by replacing the nuclear reactor and making it an conventional submarine. whose projected displacement is more than 4000 tons. The conventional variant called as shortfin Barracuda Block 1A. France also showcasing the model of Mistral helicopter landing ship in the expo. who offered the Mistral many times before, Where govt yet to announce the winner of the project. Mistral along with Juan Carlos leading the project. The Mistral was once studied by Indian navy, However they rejected the model due to the podded propulsion system. DCNS joined with Reliance's Pipavav shipyard to build those LHD's in Indian shipyard, to accelerate the construction govt announced in the RFI, that two shipyards will be selected to build those ships. DCNS announced that they will ready to redesign the ship as Indian Navy wanted. French also displays the evolved air craft carrier model in the Def Expo, with the operating capacity of some 40 aircraft's. However sources say the proposed aircraft is conventionally powered, with assisted launching. Indian navy in talks with the Americans to build the next gen aircraft carrier. France and Russia also proposes their interest in building one for India. However It's highly unlikely India won't look on other models. DCNS also showcasing the lightweight MU 90 torpedo, which can be launched from warships and helicopters assigned for ASW mission. The MU 90 jointly developed by french and Italian company, which is already being used by many nations. Indian navy also looking for Torpedo's for both surface and submerged launched platforms, The MU 90 is one of best available system, however Indian Varunastra torpedo also evolving as a best system, Varunastra also offering Helicopter launched, Sub launched and Ship launched version, However the torpedo programs are kept as secret, where more details are not available in open media.